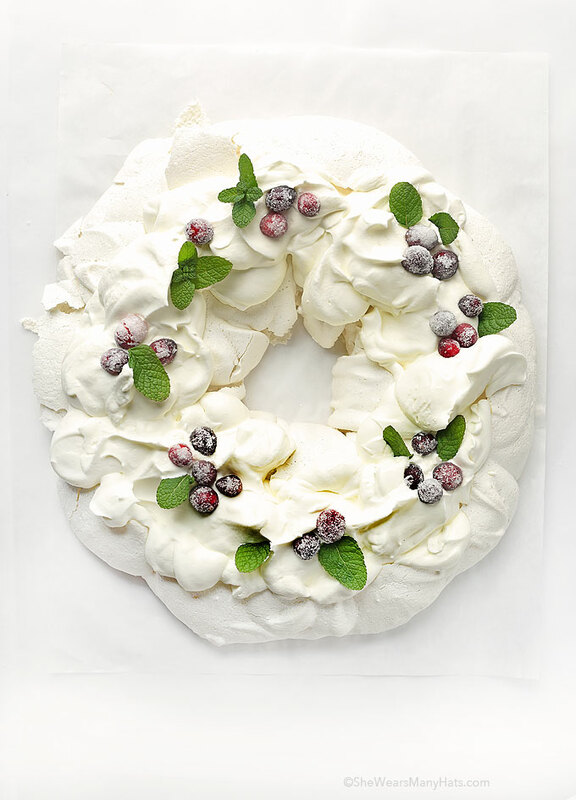 This festive holiday Pavlova Wreath is such a lovely dessert and makes the perfect addition to any special occasion. 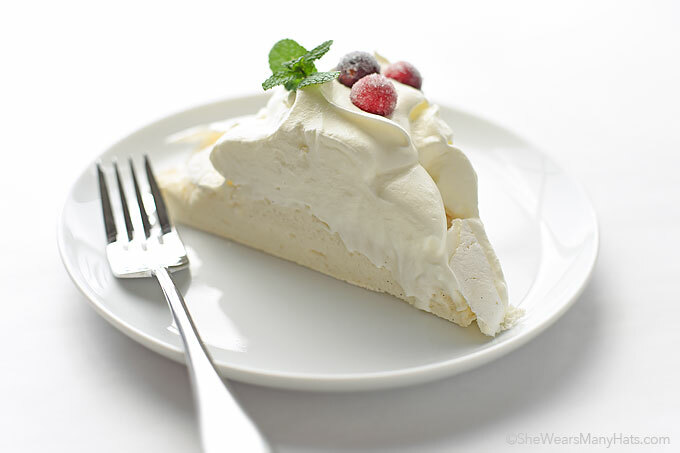 Pavlova is a meringue dessert with a delicate, crispy crunchy shell that hides a soft light, marshmallowy, almost custard-like inside and is traditionally served topped with whipped cream and fruit. In the culinary world, there are those dishes that just beg for a little more looking into, or research, as it were. Sometimes it’s nice to have a little background on where a dish originated or where did the funny sounding name come from, like Turkey Tetrazinni, Bubble and Squeak, or Pavlova. The majority of recipes I share here are ones I’ve made multiple times. Every once in a while I share something that is brand new to me, but I make sure to do a good bit of reading and research first, because I’m curious. And, of course, I don’t want to pass along bad information. But mainly, it’s because I’m curious. So when I began planning on my first endeavor with a Pavlova, I did some digging around before whipping up this delicious and gorgeous dessert. 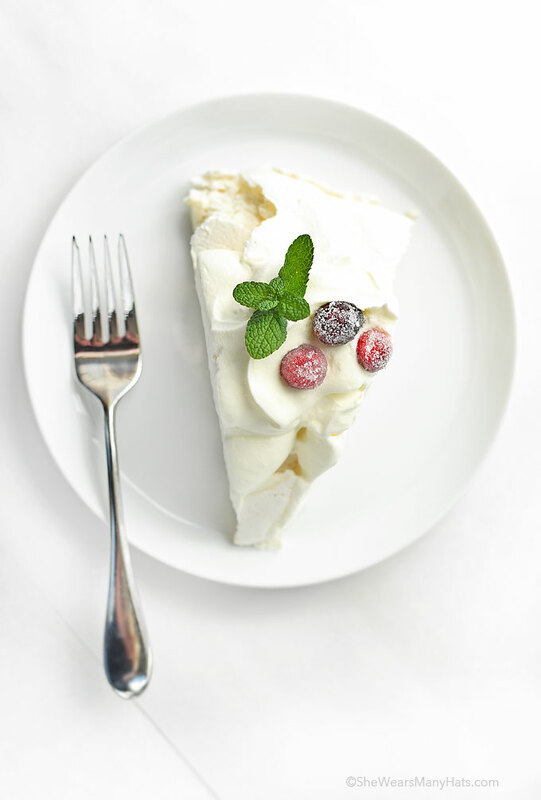 Did you know that the Pavlova is believed to be created for the Russian dancer, Anna Pavlova, in the late 1920s as she toured Australia and New Zealand? I wonder if she was crispy and delicate too? 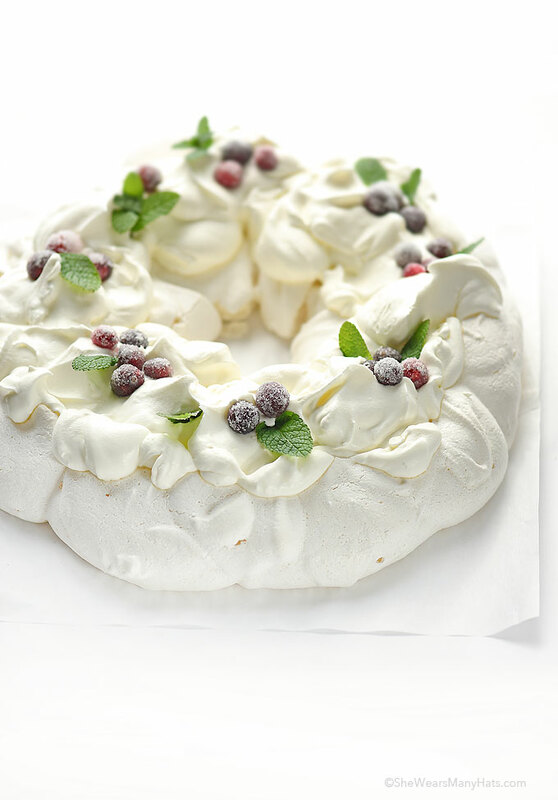 And even though there has been debate over the years as to whether the Pavlova originated in Australia or New Zealand, according to the Oxford English Dictionary, via BBC News, and cited again via Wikipedia, New Zealand is where the Pavlova was first created. Wherever it was invented, it doesn’t matter to me. I’m just thankful for whoever created it. I’m a big fan. 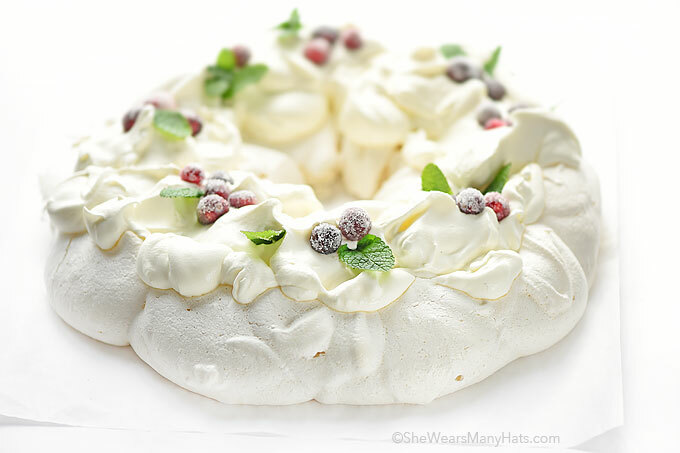 A scrumptious and beautiful Pavlova Wreath is so perfect for any holiday occasion. I decorated this one with sugared cranberries and fresh mint leaves for a festive addition to a holiday table. Other berries can be substituted to make it a seasonally appropriate wreath for any time of the year. While pavlova can be made ahead by a few days, humidity is not a friend of meringue, so if making ahead it’s best to be prepared with an airtight container large enough to store the Pavlova. Add the whipped cream and fruit right before serving as the moisture from both as well as weight will begin to break down the Pavlova. Don’t be in a hurry. This recipe is really not difficult. As with most things in life, take your time at each step. Once the meringue has finished cooking, follow the instructions and leave it in the oven (that has been turned off) to completely cool. Completely. Cool. This means planning ahead. Reserve that oven space! As I mentioned above, this can be made ahead by a day or so and kept stored in airtight container. The wreath I made barely fit on a 13×18-inch baking sheet. If you don’t have a baking sheet that large, make an oval wreath OR make two smaller wreaths. Egg whites are easier to separate from the yolk when cold. As far as the granulated sugar goes, I have found that certain brands are finer than others. The finer the sugar grain the quicker it will dissolve into the egg whites. If you own a food processor you can quickly pulse granulated sugar to a finer texture if you’d like. 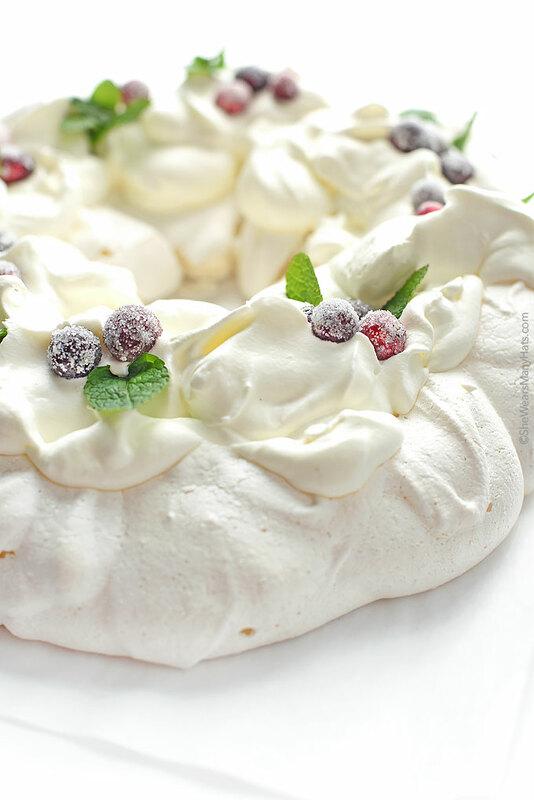 Pavlova is a meringue dessert with a delicate, crispy crunchy shell that hides a soft light, marshmallowy, almost custard-like inside and is traditionally served topped with whipped cream and fruit. Preheat oven to 400-degrees F. Line a large baking sheet (at least 13x18-inches) with parchment paper. Using an electric mixer whisk egg whites on high until stiff. Continuing to beat, gradually add sugar and beat until dissolved. Add lemon juice and extract, then sprinkle/sift in cornstarch; beat on high until very stiff and glossy peaks form, about 3-5 more minutes. Using a rubber spatula, gently shape meringue into a ring. Reduce oven temperature to 200-degrees F. Bake meringue for 1 hour and 15 minutes. Turn off oven and leave meringue in oven until completely cooled (about 4 hours or overnight). **Store in airtight container until ready to serve. Before decorating, gently transfer the meringue to a cake plate. In the bowl of a stand mixer fitted with a whisk, beat heavy whipping cream until stiff peaks form. 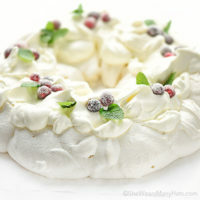 ***When ready to serve, gently spread whipped cream evenly over top of meringue wreath, or using a frosting bag with wide tip, pipe whipped cream as desired on top of meringue. Optional: Decorate the top with sugared cranberries and fresh mint leaves. *As far as the granulated sugar goes, I have found that certain brands are finer than others. The finer the sugar grain the quicker it will dissolve into the egg whites. If you own a food processor you can quickly pulse granulated sugar to a finer texture if you’d like. **While I wouldn't recommend it, Pavlova can be made ahead a few days, BUT humidity is not a friend of meringue. So if making ahead, it’s best to be prepared with an airtight container large enough to store the Pavlova or wrap gently (but completely) with plastic wrap. Add the whipped cream and fruit right before serving as the moisture from both (as well as weight) will begin to break down the Pavlova. ***Add the whipped cream and fruit right before serving as the moisture from both as well as weight will begin to break down the Pavlova. Don’t be in a hurry. This recipe is really not difficult. As with most things in life, take your time at each step. Once the meringue has finished cooking, follow the instructions and leave it in the oven (that has been turned off) to completely cool. Completely. Cool. This means planning ahead. Reserve that oven space! As I mentioned above, this can be made ahead by a day or so and kept stored in airtight container. The wreath I made barely fit on a 13x18-inch baking sheet. If you don’t have a baking sheet that large, make an oval wreath OR make two smaller wreaths. Gosh this looks good. Pavlovas have always intimidated me. I think I’ll give it a try for New Years Eve. I think it would be gorgeous for New Years Eve. I’m thinking about making one for then as well. Let me know how it turns out for you! That looks too pretty to eat! What a gorgeous dessert. Your sugared cranberries on top are the crowning touch. Maybe New Year’s Eve for me too! That sounds like a perfect New Year’s plan to me. Maybe the prettiest pavlova ever! Looks lovely. I’m confused about the cornstarch tho. Cornstarch is a regular ingredient for most Pavlova recipes. From what I understand after reading and research before first attempting a Pavlova (please note that I’m no scientist or trained chef), the cornstarch helps stabilize the egg proteins and prevent them from overcooking. The acid (I used lemon juice in this recipe, most recipes call for vinegar, others cream of tartar) helps to stabilize the egg proteins too but in another way: to help prevent them from deflating or collapsing. I hope that helps a bit. I’m confused about your recipe. 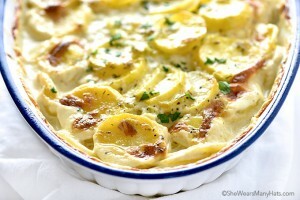 How do you sprinkle the cornstarch if it is mixed into the vanilla and lemon juice? Whoops! I fixed the instructions to read correctly. Sorry about that and thank you for pointing it out! Amy, this holiday dessert is beautiful!! This is just stunning! I could look at these photos all day. I hope you have a fabulous Holiday! You’re so sweet, Liz. I hope you have a lovely holiday too! This is just enchanting! Have a wonderful holiday! This is such a beautiful and festive holiday dessert. I am totally swooning over this, Amy! It’s just beautiful…and I know it must be delicious as well. One of the prettiest holiday desserts I’ve ever seen! I would love to share one of these with you and your family! Miss y’all! beautiful presentation sure to be delicious too. I invite you to stop by and share at the Thursday hop ( you can link up until Saturday at midnight. Hugs! 8 egg whites was TOO much! It expanded during baking. Not only did the hole in the middle close up, but it just barely fits on the platter now. Thank goodness I didn’t pipe the mixture to the edge of the circle. I did cut out the center to make it look like a wreath, had a taste and it was heavenly! Oh nice! That would be lovely, Dina. It would take some testing to reduce the sugar with good results. It can only be reduced so far and still crisp properly. I have not tried it with less sugar, but let me know if you do and how it turns out! If you make 2 smaller wreaths does that affect the cooking time? 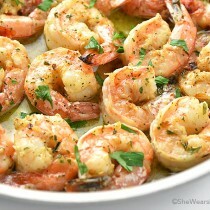 OMG This looks sinfully delicious. I cannot wait to try. Thank you for your lovely recipes. It really is easier than you think. AND fun too! This pavlova is so beautiful! I’ve got pavlova on my long list of new baking skills to learn and I love this post. Whenever I get around to making my own, I’ll definitely blitz the sugar first to help it dissolve faster. Such a great tip! This was so painfully sweet, we couldn’t eat it. I even served it with a tart lemon curd and it did not cut the sweetness. I made this Pavlova for Christmas lunch dessert. It was easy to make but turned out absolutely delicious! All my family loved this. It looked amazing and the fudge sauce drizzled over the raspberries was delicious. Thank you for the great recipe, Amy! 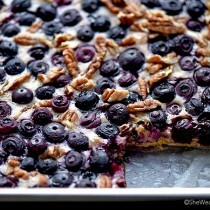 Making desserts is just one of the things I’d love to do in my kitchen. 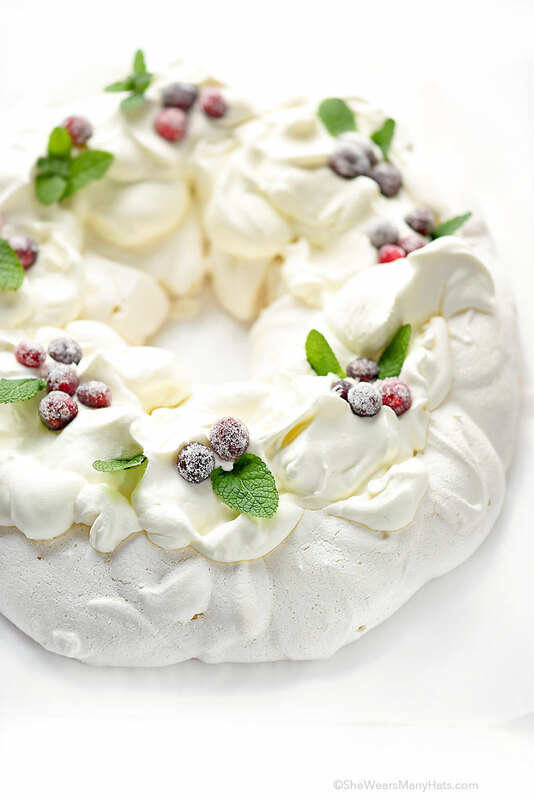 It’s just so amazing how things get better with your Pavlova Wreath recipe. 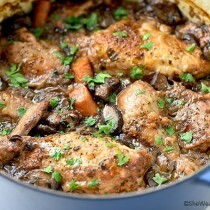 This is the recipe is just one of those that I should be cooking myself to make occasions more delightful.